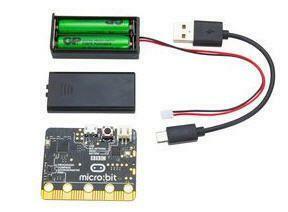 The micro:bit is a pocket-sized computer that lets you get creative with digital technology. You can code, customize and control your micro:bit from anywhere! Use your micro:bit for all sorts of unique creations, from robots to musical instruments and more. At half the size of a credit card, this board is equipped with a surprising amount of hardware, including 25 red LED lights that can flash messages. There are two programmable buttons that can be used to control games or pause and skip songs on a playlist. The micro:bit can even detect motion and tell you which direction you’re heading. It can also use Bluetooth Low Energy (BLE) to interact with other devices and the internet. On the front of the board you will find the 5×5 LED array, which you can use as a light sensor; a tiny screen to draw on or display words, numbers and other information; and the two programmable buttons! On the back of the board you will find the brains of the micro:bit, a 16 MHz, 32-bit ARM Cortex-M0 microcontroller with 256KB Flash, 16KB RAM and a built-in temperature sensor. Additionally, the back of the micro:bit is populated by an accelerometer, compass and Bluetooth Smart antenna, as well as a microUSB and two-pin JST connector for different power options. Finally, at the bottom of the board you will find 20 gold-tabbed edge pins and five ring connectors (three for digital/analog I/O, two for power and ground) for hooking up external components. The tabs with larger holes can be easily used with alligator clips to prototype added components quickly.